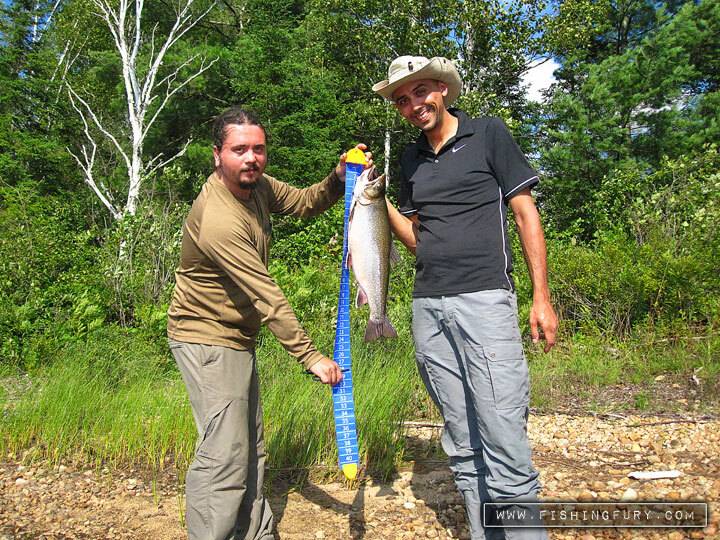 Algonquin Park Galleries | FISHING FURY - A Fishing Blog with Attitude! If you haven’t visited our gallery in a while you might not know that I’ve uploaded several albums of photos from my various trips to Algonquin Park this year. It’s almost hard to believe I’ve already done a handful of trips there this year, and the year isn’t even over yet! Check out the photos, including this one of my friend Patrick with the biggest splake trout I’ve ever seen, not to mention Patrick’s now personal best, and the Snap Shot Ruler in action! Check out the updates to our Gallery! Uummm Laker??!! You’re jiving us right coldtrain?! I spent some time looking at a bunch of identification charts and you’re right Fidel, this is probably a splake trout and not a lake trout. It’s not a brook because it doesn’t have a red belly, but it did have red spots- but not the blueish halos around them. Wow that is an AWESOME looking fish! I haven’t had a chance to use my Snap Shot Ruler yet but when I do, I hope it’s on a fish as nice as that one. Dave Mercer Smashin’ Lake Erie Smallmouth | Fishing Fury - A fishing blog with attitude! Wow, now that’s a nice trout. By the way I love the photo’s. Great Blog!